Spring Break was the perfect opportunity for us to get out and go downtown to tour the Denver Art Museum. Their permanent collections are fabulous, but there is a temporary exhibit until May 1, titled "Blink!," that we wanted to see. Additionally, the museum has just renovated its American Indian Art gallery, and we wanted to explore what's new! ﻿Unfortunately, we missed the controversial unauthorized Origami art installation, which made the Denver Post news that day. The boys were circumspect about whether they would truly enjoy their day. Of course, I would love to spend countless hours just gazing at the European and Modern Art collections, but that schedule won't fly with two young children. 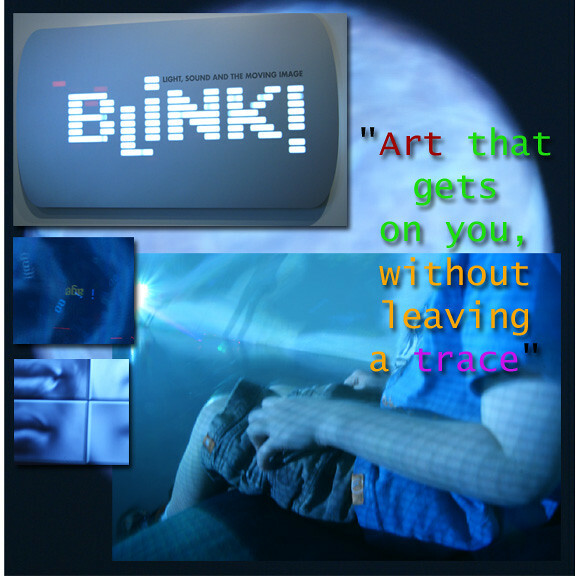 The current exhibit, "Blink!," is one that is very conducive to children, but be warned that it can be highly stimulating. "Celebrating the radical transformation of technology over the past 30 years", this collection features "electronic and time-based media." I believe all of the subject matter is appropriate for family viewing, and kids will be delighted by the lights, sound and movement that is out of our ordinary experiences with media. We particularly enjoyed "Chamber" by Charles Sandison, which surrounds you in a room of streaming currents of words. Encourage your children to find a word, and point to it. Watch how the images morph on your skin and clothing, and how shadows interact within the space. We also loved "Still Men Out There" by Bjorn Melhus, which features up-ended vintage televisions that broadcast a themed soundtrack synchronized with light. Stop and sit for a bit on the bench and enjoy the wonder of this unique piece. 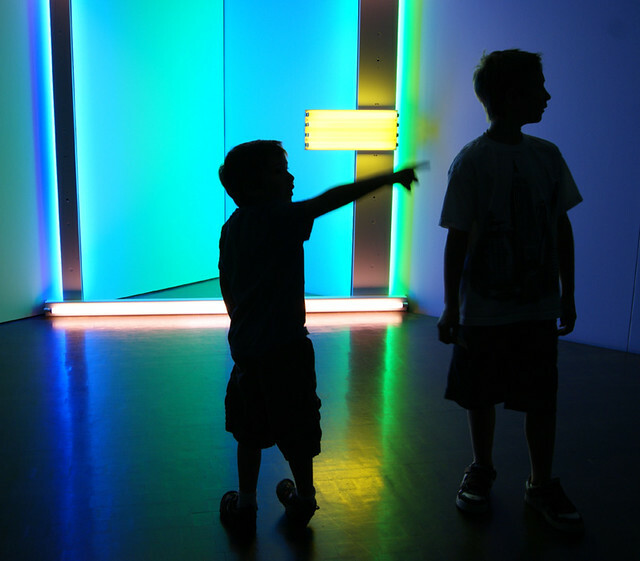 Encourage your children to stop, amidst the hyper-active exhibit that is teeming with flashing lights and sounds, and ask them questions about these artworks. How does it make them feel, how do they think it was made, why do they like this piece, or why not? These questions spark great conversations! 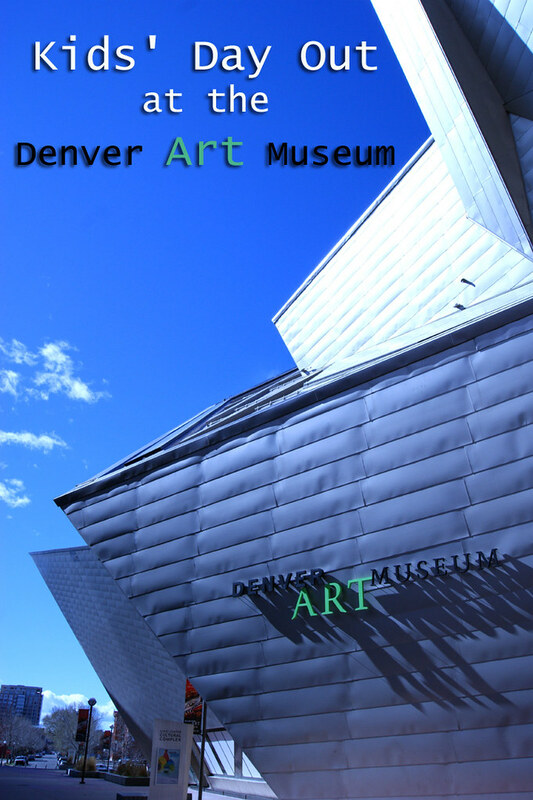 When you visit the Denver Art Museum, it is important to know that they have tons of activities geared for helping children learn how to negotiate through a gallery space. 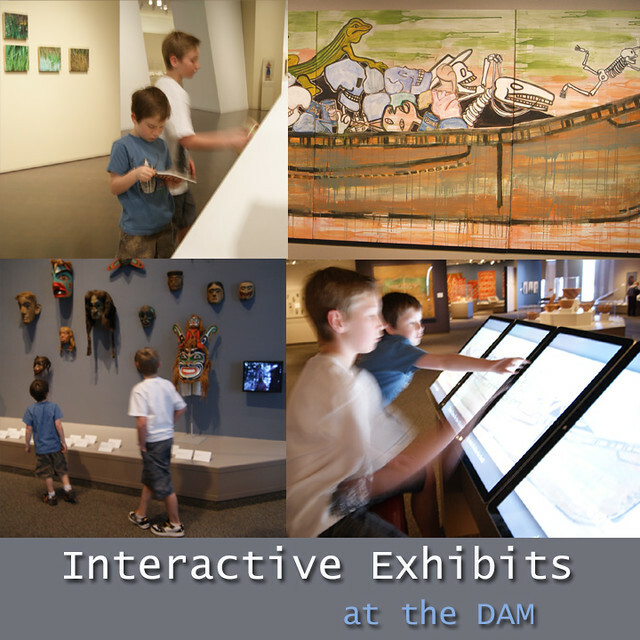 From "I-Spy" and "Art Bingo" cards placed within the galleries (top left), art "hot spots" and educational backpacks that can travel through the museum, to the new interactive screens in the American Indian Gallery (lower right). This incredible touch screen display helps viewers understand the imagery that Jaune Quick-To-See-Smith included in her wonderful painting,"Trade Canoe for Don Quixote"(top right). We loved the remodeled American Indian Gallery! A wide variety of art is on display, from historical artifacts to contemporary paintings. The boys loved seeing an authentic tipi from the 1800's, as well as the exquisite Indian Chief headdresses. This permanent collection sets a high bar for art museums! The DAM has commissioned a sculpture by artist Roxanne Swentzell to greet visitors at the exhibit. 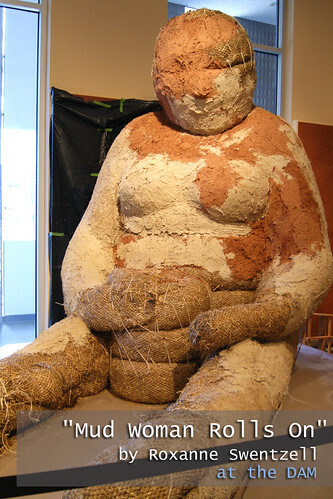 Visitors can watch her build the storyteller sculpture with straw wattles and Colorado adobe on certain days of each week. This sculpture was initiated this spring and will likely be completed in the fall. 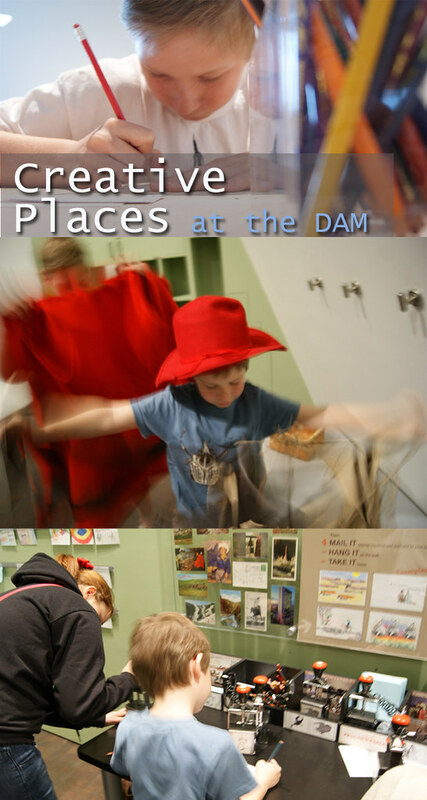 Throughout the DAM, there are places for kids to be kids! There's always a fun, interactive video installation on the second floor of the Hamilton Building, near the entrance to the Western-American Art gallery (bottom image). There's also the Just For Fun Family Center, on level 1 of the North Building (middle image). Here, children can play art-themed games, dress up like King-Tut, and make a masterpiece of their own to take home. 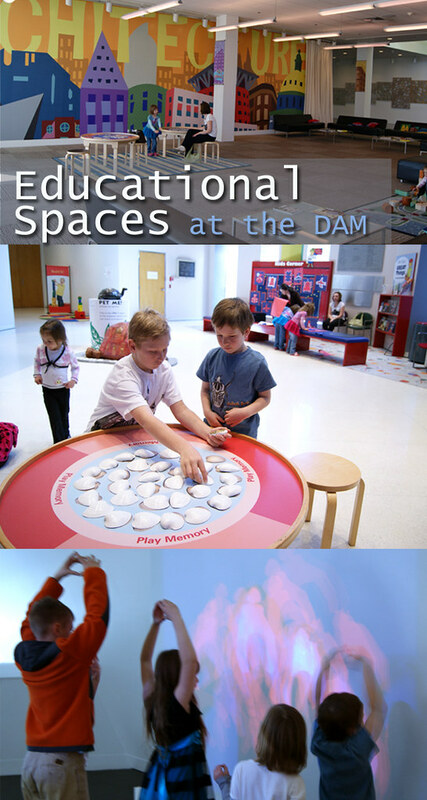 On level 2 of the North Building (top image), there is a space for children to draw, read, (have a snack) and play with large architectural blocks. This is also where you can step out on the balcony and catch a gorgeous view of downtown Denver and the Denver Public Library. This is no stuffy, boring art museum! It's very easy to find plenty of things to inspire your children to appreciate art. Stop to make a postcard (bottom image), or dress up like "Long Jakes" by Charles Deas (middle image), in the Western-American Art gallery. To find available projects, ask a museum host what activities are going on, or look at the schedule in advance. Right now, you can create your own flip-book or image spinner as a part of their highlight on animation with "Blink!" (top image). Have a great time, and be sure to let me know how you enjoyed your visit!